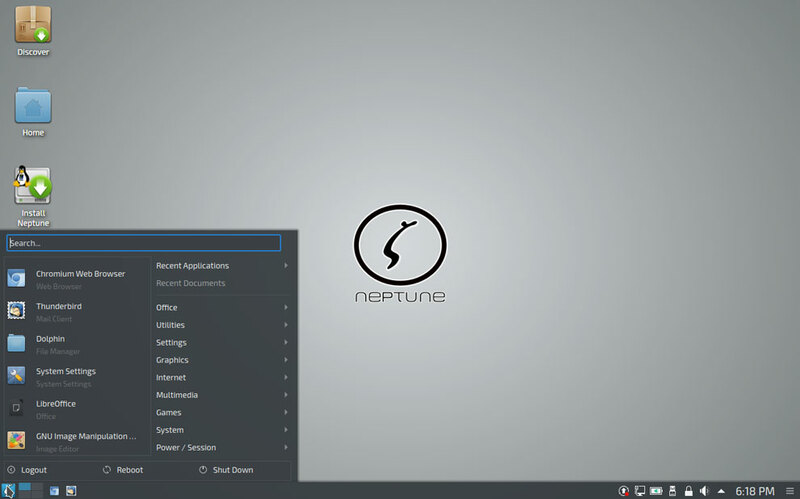 ZevenOS’ Neptune 5.0, released earlier this month, offers a refreshing take on a classic KDE-based Linux distro. Neptune offers much more. A hard drive installation maximizes this distro’s speed and ease of use. It ships with the latest Plasma long-term support. It features stellar artwork that pops whether you are running GTK+2, GTK+3 or Qt4 or Qt5 applications. Its attractive icon theme provides a handsome user experience. You easily can switch the Look and Feel, and experience a totally different desktop experience with one of Neptune’s several alternative themes. Neptune Refresh is based on the current Debian 9 Stretch, but it changes the distro’s updating method. Rather than focusing on more recent versions of Plasma, Kernel or other software as a community, the developers have chosen to rely on Snaps, Flatpaks and AppImages for users who want bleeding-edge software. Neptune 5.0 includes KDE’s Plasma 5.12 LTS desktop and a backported version of the Linux kernel 4.14 for additional hardware support. 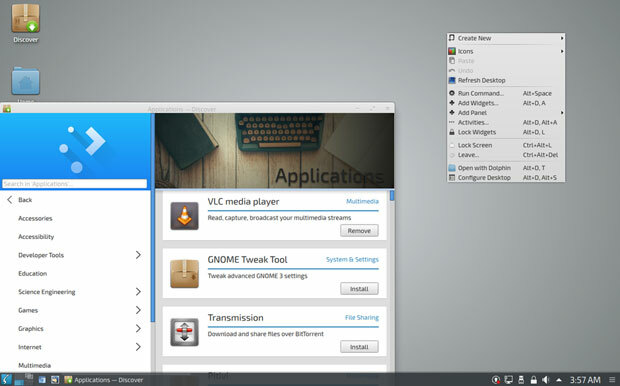 It also uses KDE Applications 17.12 and KDE Frameworks 5.43. The developers retained their previous solid focus on multimedia. Neptune 5.0 includes the community’s Encode application for recoding audio and video into various formats, such as h264, webm, mkv, mp3, aac, flac and more. Its simple configuration interface lets you customize codecs, bitrate and more. Neptune 5’s Discover Package Manager is neat and simple to use. The added desktop feature of right-clicking on the screen makes other system controls handy to access. 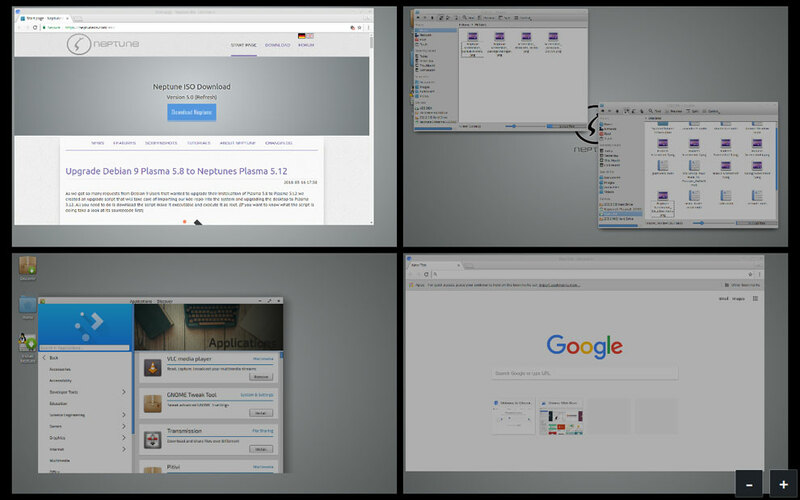 Neptune 5 includes many of the latest versions of Linuxland’s most in-demand applications. For example, default applications include LibreOffice 6, Chromium 64 as an alternative to Google Chrome, and Thunderbird 52.6 for handling email. If you prefer live session environments, you can use Snapshot Manager to create a snapshot image of a live system. This can be very useful if you combine it with a small number of snapshots for the live system already provided within the Snapshot Manager application. You can find more snapshots shared on the community’s Neptune Forum. Neptune’s hardware manager provides a simple tool for installing proprietary graphics card drivers or printer drivers. This application automatically recognizes the graphics card and offers any available proprietary graphics card driver replacements. Neptune’s Plasma interface is uncluttered and cozy. It is easy to put your own touches onto the desktop decor. You can place launch icons on the favorites panel, on the desktop, and on the bottom panel with a right-click on any menu entry. However, in this one the Plasma 5 desktop environment is an inviting alternative to my two favorite choices — Cinnamon and Xfce. 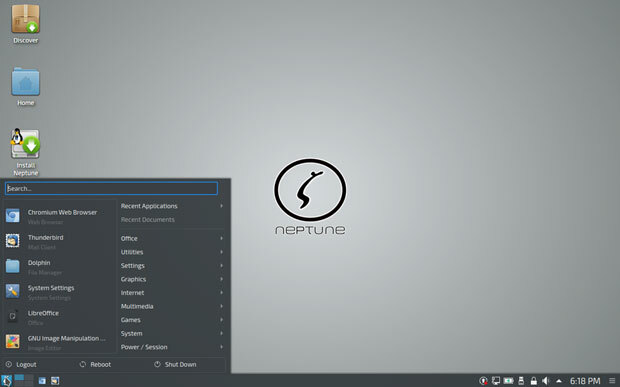 This latest Neptune release offers a computing environment that sits comfortably between both of those desktop options. One notable weakness: If I ever wanted to play any computer games, I would be disappointed with the few meager choices in Neptune’s game menu. It offers only GNUDoQ, KBreakout, KMarjongg and KMines. What, not even a solitaire game? Come on!